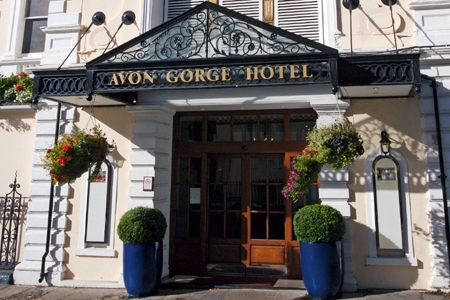 Many hotels claim they have a decent view but the location of Bristol’s Avon Gorge Hotel takes some beating. It’s situated on the edge, quite literally, of a deep gorge in the heart of Clifton Village, overlooking Brunel’s fabulous Clifton Suspension Bridge. This hotel will always remain close to my heart, being the place where I met my wife. 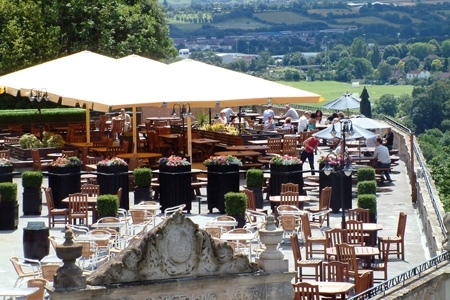 I expect many visitors will fall in love with the place, especially after sipping a cool drink on the terrace of the White Lion Bar on a hot summer’s evening with the bridge as the backdrop. The hotel, which offers free wi-fi throughout, has a rich history. It opened in the 1890s as the Grand Clifton Spa and Hydropathic Institution, attracting aristocracy and gentry. Over 100 years later, it still retains an air of elegance and has embraced modernity whilst never forgetting its past. My family and I stayed one night and I’m pleased to say the parking options work well, especially when one considers the hotel is situated in the exclusive region of Clifton where parking can be difficult. There is a small car park behind the hotel and if this is full, parking permits (free of charge) for nearby streets are issued. Checking in was efficient and we were advised about the complimentary day pass we could take for the Clifton College Fitness Centre, just a short walk away. 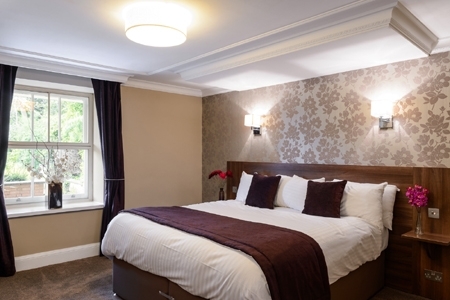 In fact, the hotel is ideally suited for many attractions, such as a stroll across the suspension bridge to the interesting information centre charting the history of Brunel’s masterpiece. A walk around the village itself is worthwhile, too. But make sure you leave time to visit Clifton Observatory and Cave, just a few minutes’ walk away. A former mill, the observatory houses a camera obscura, dating from the early 1800s, one of just two obscuras open to the public in England. The owner at that time, William West, also dug out a passage to Ghyston’s Cave, where you can enjoy a great view of the gorge and bridge. Please note: the passage has steep steps and the ceiling height is, at times, relatively low. It’s worth visiting, though. Back at the hotel, breakfast and evening meals are served in the Bridge Café where diners can enjoy, once again, views of the gorge and suspension bridge through the floor-to-ceiling windows. The buffet breakfast was enjoyable and thankfully, for us, soya milk was available – it surprises me the number of hotels which still don’t stock it. Our evening meals were delicious, from the pea and broad bean risotto I chose to the huge pizza dished up for my eight-year-old son. Service was good and the food presented to us with a smile; in fact, staff throughout the hotel were helpful and cheerful. Unfortunately, I do have a few comments regarding our accommodation: Garden Suite 1, alias the President’s Suite. 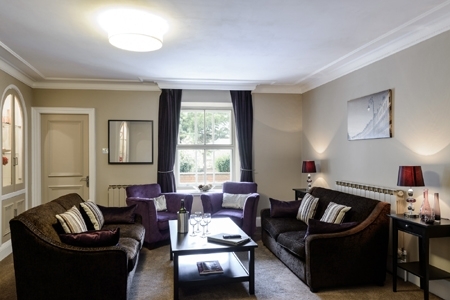 Although spacious, clean and containing everything needed for our stay, including a sunken bath, hairdryer, TVs, tea and coffee-making facilities and access to a pretty garden, there are some areas which need mentioning. With no air conditioning and just one window between two bedrooms and living area, it can get hot during warm weather. If, like me, you enjoy some fresh air you’ll want to open the window. However, a large extractor fan system is situated right outside. Not only do you hear the constant hum of the machinery working, you can smell cooking fumes entering the suite, too. My other two grumbles regarding this particular suite is, firstly, that it’s situated directly beneath the White Lion Bar so you hear the murmur of voices and footsteps above. And, secondly, it’s lovely having access to the garden but it would be wise to issue guests with a key for the Yale lock. If you want to shut the back door, you won’t have a key to get back in and have to return via the bar to access the suite’s front door, for which you have a key. Of course, my comments relate to just one suite in a hotel offering 75 recently refurbished rooms, including two Gorge view suites, eight family rooms and the two garden suites. Prices start from £89 (£119 for family rooms) and include breakfast. The rooms – individually styled – have been tastefully decorated. Despite the aforementioned comments regarding my own accommodation, there is no doubting this is a fine hotel with a view to die for – I’d highly recommend it.